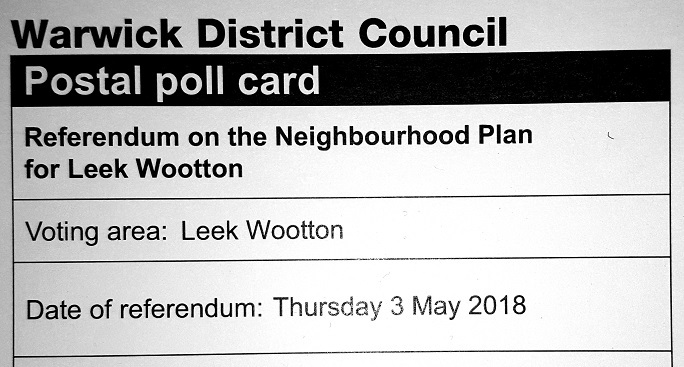 At the Public Meeting about the Neighbourhood Development Plan Referendum on Tuesday, 27 March, the Parish Council distributed a Traffic Calming Survey to explore initial thoughts and ideas about traffic calming in Leek Wootton & Guy's Cliffe. 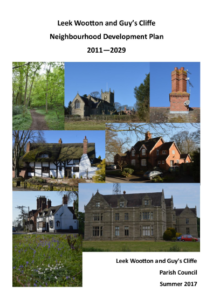 The submission version and subsequent Examiner's Report are available to view on the Neighbourhood Plan page. The date of the referendum is yet to be confirmed by Warwick District Council, but is suggested this will be after Easter. The Parish Council will be organising a public meeting before Easter. "The Examiner has reviewed the NDP in detail, its audit trail to completion and external representations made. His recommendations for amendment take account of the adoption of the WDC Local Plan and changes to the National Planning Policy Framework, which have taken place since the NDP preparation. 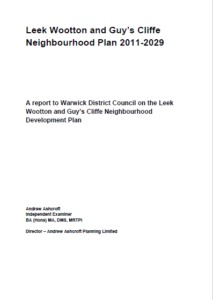 The WDC Local Plan policies now effectively supersede many elements of the NDP but important policies regarding the design and character of future development are retained. Unfortunately, some of the NDP’s more prescriptive proposals regarding layout and scale of development across the Woodcote site have been “watered down” by the Examiner’s recommendations. The overall number of new dwellings is nonetheless kept at 115. 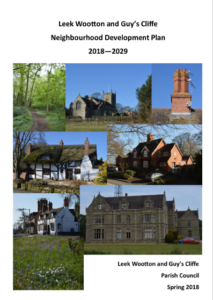 A new masterplan will now be prepared by the advisers to the Police, setting out their detailed proposals for the redevelopment, in line with the Local Plan policies. "The Council believes that it is crucial that it should continue to have a voice in this process and formal ratification of the NDP is therefore paramount, in order that the NDP can have formal standing under the Localism Act. Having a “made” NDP in place also has important implications in terms of future access to the Community Infrastructure Levy (CIL), which will henceforth apply to all new developments. "Acceptance of the Examiner’s recommended modifications is thus an essential precursor to the formal referendum, which we now expect to take place in mid-March. 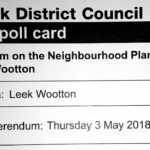 "The Council will issue an explanatory note and will hold a public meeting to explain the implications of the Final NDP, as well as the importance of the referendum and the CIL to our community. The public meeting will also provide an opportunity to discuss future traffic management through our parish. Further information on actual dates will follow in February."